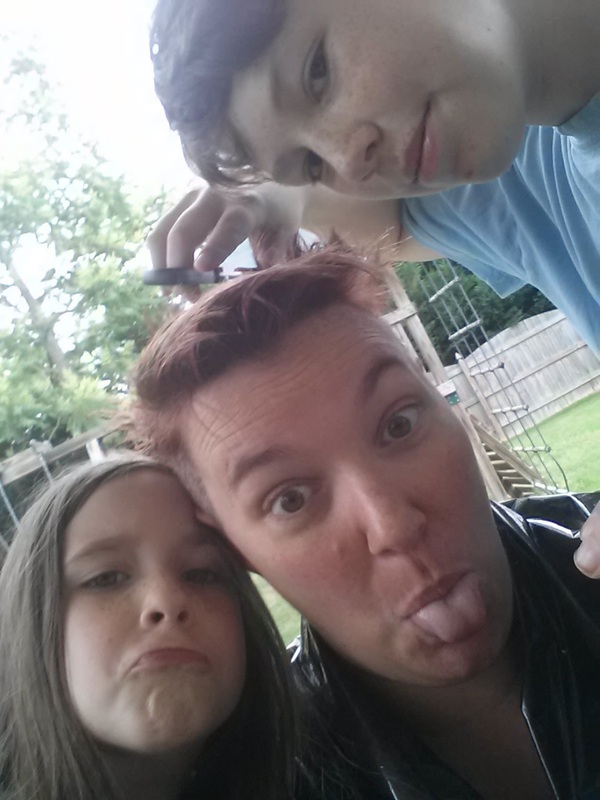 Home / Chemotherapy / featured / Personal / Symptoms / Family fun... shaving mom's head! I am going to hand over scissors to these two??? 1. Don't cut off mom's ears. 2. Stop if I say stop... since my bones are still sore. 3. Don't cut anybody else's hair - even your own! 4. Cut it any way you like - really - have fun with it. After determining that it was going to be a messy undertaking, we opted to move the salon session to the back porch. Then we turned on some music and I turned over the scissors over to the kids. They began creating their masterpiece! After some time and hair falling, they came to my first new hairdo. It was the first of many looks... a semi-punk hairstyle! Hey Ho. Let's Go.... more hair to cut. The shorter my hair got - the more the chunks that had fallen out were noticeable. My special manged hair was being cut even more special, by my favorite people. The scissors eventually turned into an electric razor. And then it happened, I officially had the shortest hair in the entire family!! Time for my second style, an almost military high-and-tight! We can do better! That military style was too uptight for me... we could still have more fun with my hair. Come on kids get more creative... Let your imaginations run wild! 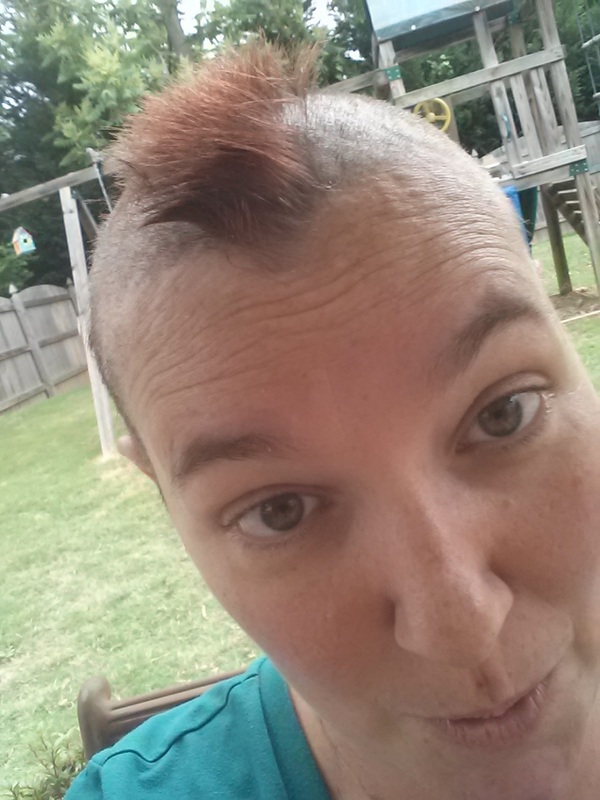 They transformed my next style from a Mohawk into a Momhawk!!! What a great day! We all had so much fun and really rocked out to what could have been a shocking situation. 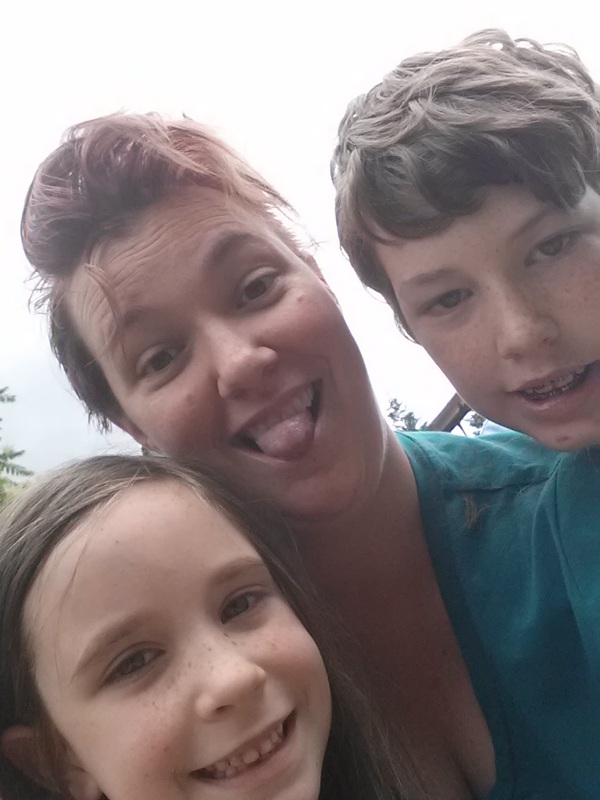 I am not sure if my kids would be good future hairstylists, but they did have a lot of fun altering my look. We laughed through the whole process and everyone got a chance to take some of my mangy hair off. While I haven't shaved off the stubble, I can't imagine it will last too much longer!